ABOVE: We are happy to have on board our new lecturer, a familiar face, Cameron Jack, who started in May. Air Potato Challenge Events, led by Dr. Carey Minteer and Ken Gioeli (UF-IFAS St. Lucie County Extension), in Leon Co. and Bay Co. (in cooperation with Julie McConnell, UF-IFAS Bay County Extension) were featured in The Panama City News Herald, The Florida Channel, and WTXL ABC 27 in Tallahassee. The event made the front page of the Tallahassee Democrat. The Florida State Horticultural Society awarded Ken Gioeli (UF-IFAS St. Lucie County Extension) and Dr. Carey Minteer the 2018 Florida State Horticultural Society’s Natural Resources Section Best Paper Award for their paper “Air Potato Biological Control Extension Program: A Success Story”. ABOVE: Many of our faculty were able to participate in the department’s research retreat at the Plant Science Unit in Citra, Florida. The retreat activities were coordinated by Dr. Bryony Bonning. Dr. Ed Vargo from Texas A&M University visited the Chouvenc Lab on June 4-5, presented a seminar at the Fort Lauderdale Research and Education Center on the genetics of invasive ant species, attended Joseph Velenovsky's PhD proposal, and went on a field trip to collect ants and termites present in south Florida. Dr. Jennifer Gillett-Kaufman and Dr. Phil Kaufman are leading the UF in Florence: Global Perspectives Study Abroad program in Florence, Italy during Summer A. This summer, 117 UF students are participating in the program where they are immersed in Italian culture for six weeks. While overseeing the safety and needs of the students in the program, the Kaufman’s also teach an experiential learning course titled Feast or Famine in Florence (ALS4404) where students learn about the influence that insects have played in Italian history, art, science and food. Students visit and learn about many important sites in Florence, including burial sites related to the Black Death, a 500-year-old olive farm known for producing the highest quality oils, the Galileo Museum of Science, to study historical scientific instruments, La Specola, the oldest natural history museum in Europe, with an amazing insect collection, and travel to Chiantishire, a site in Tuscany famous for agricultural production to learn directly from producers about their pest issues. ABOVE: The entomology team from the West Florida and Education Center met on June 7th to discuss topics including the identification of insects associated with field crops in the Florida Panhandle, the concepts associated with the herbicide tolerant plants and Bt technology in corn and cotton. They also discussed the protocols of the projects that will be performed during the 2018 summer. Meeting participants included: Dr. Paula-Moraes, Latisa Ledbetter-Kish (Dr. Paula-Moraes’s technician), Jessica Baldwin (master student in the Entomology & Nematology Department), Chris Hemphill (OPS of the entomology laboratory at WFREC), Supreet Kaur (summer internship student from Microbiology Department) and Scott Butts (OPS working with Dr. Paula-Moraes on the production of videos for the 2019 IPM3022 course). In Gainesville, we welcome James Weaver (MS, Dr. Mallinger) and Xiao Lai (Ph.D., Dr. Wong). Joining us at the REC’s, we have Austin Fife (Ph.D., Dr. Martini, Quincy), and Victoria Adeleye (MS, Dr. Seal, Homestead). And we are also pleased to introduce our non-campus MS students—Caitlin Gill, Kaydie McCormick, and Lincoln Wells. Sage Thompson received a $1,000 scholarship from the Space Coast Gator Club. The Space Coast Gator Club has 7,500+ members who are all UF alumni that raise money to support Brevard County students at the University of Florida. In addition to supporting students through scholarships, the club also offers the use of their network to search for open jobs and internships for Gator grads. ABOVE: On May 30th the DPMSO hosted an event at NATL focused on demonstration of insect pest traps used in surveys and monitoring. Speakers included Gabrielle LaTora from Dr. Liburd’s lab, Brad Danner from FDACS-DPI/CAPS, and Morgan Pinkerton and Sage Thompson from Dr. Hodges’ lab. We covered traps for stink bugs, spotted wing drosophila, the emerald ash borer, bark beetles, weevils and moths. Ph.D./DPM student Cory Penca presented at the 2018 Peach Field Day held at the PSREU in Citra, Florida. The topic of his talk was practical pest management in Florida peaches. Dr. Richard Baidoo, a Ph.D. (2015) alum of our department with Dr. Crow just started his new job as Discovery Nematologist with Corteva Agriscience (Dow-Dupont) in Indianapolis, IN. ABOVE: Field season has begun in the Lucky lab. Pictured above, the team is collecting leaf litter samples to capture foraging ants. Undergraduates Lexie Nielsen (left) and James Pinkney (right), recent UF Entomology and Nematology graduate Katie Carroll (middle), and Master’s student, Rachel Atchison (not pictured) make multiple weekly trips to the Ordway-Swisher Biological Station to collect ant diversity data to discern how ant-mediated seed dispersal is affected by fire management in longleaf pine sandhill habitat. Dr. Adam Wong is welcoming two graduate students to his team: Xiao Lai, a Ph.D. student with a Masters degree in Plant Pathology from North Dakota State University, started in the Summer; Matthew Pileggi, a Masters student recently graduated from UF has been an intern in the Wong lab since September 2017, he will be starting in the Fall. Supreet Kaur is an undergraduate student from Microbiology and Cell Science; she is working at UF/WFREC under the supervision of Dr. Moraes. Supreet's work is part of a summer research program funded by the National Science Foundation and USDA grants that provide summer stipends for undergraduates to conduct faculty-guided research projects. 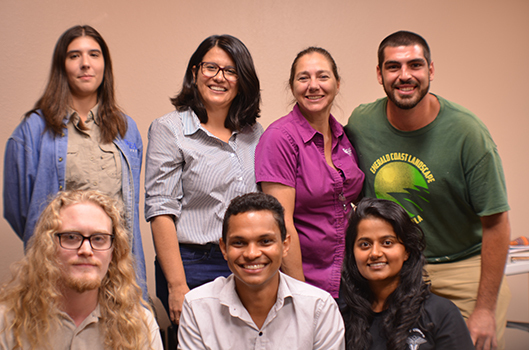 Supreet has been involved in several experiments in the field and laboratory, working with Lepidoptera associated with cotton and peanut in the Florida Panhandle. Ethan Doherty, MS graduate student in the Dale Lab, successfully defending his master's thesis titled, "The Effects of Turfgrass Cultivar Diversity and Composition on Herbivore Fitness and Behavior", on June 7th. Matthew Borden, Ethan Doherty, Rebecca Perry, and Brianna Whitman (students in the Dale Lab) gave presentations about their independent research projects to landscape industry professionals at the Southeast Pest Management Conference on May 9th in Gainesville. ABOVE: Last semester the Lucky Lab said goodbye and good luck to undergraduate Nate Duerr, who graduated in Spring 2018 with a major in Zoology and a minor in Entomology. You may have seen Nate’s Art-Science University Scholars Program project on display in the Entomology and Nematology Foyer—he constructed a fully rotatable and phylogenetically accurate mobile depicting the evolution of the ants (Hymenoptera: Formicidae). Nate has just begun his Peace Corps assignment in Panama. Congratulations, Nate! We are looking forward to hearing about your work, and all of the great insects you encounter! Need to name that bug? A host of experts are available to help Floridians identify any insect or related arthropod. If a mystery creature has six or more legs, the UF Insect ID Lab is the place to call. Need insect images? You can go to this direct link, pictures are copyrighted material and intended for official UF use only, log onto the website using your Gatorlink credentials. Lyle Buss is the UF/IFAS Insect ID Lab manager. Think it might be a nematode problem? The Nematode Assay Laboratory serves Florida and other states by providing nematode assays and expert advice regarding nematode management. Atchison RA, Hulcr J, Lucky A. 2018. Managed fire frequency significantly influences the litter arthropod community in longleaf pine flatwoods. Environmental Entomology 47: 575-585. Chouvenc T, Foley JR. 2018. Coptotermes gestroi (Wasmann) (Blattodea [Isoptera]: Rhinotermitidae), a threat to the southeastern Florida urban tree canopy. Florida Entomologist 101: 79-90. Dale AG, Lewis C, Momol E, Rainey D, Bossart J, Bain CJ, Marvin J, Barber L, Leppla N, Knox G, Ankerson TT. 2018. Florida-Friendly Landscaping Guidelines for Community Associations: Considerations for selecting a landscape contractor and writing an effective landscaping contract. EDIS publication ENH1080. UF/IFAS Extension. http://edis.ifas.ufl.edu/ep347. Erram D, Burkett-Cadena N. 2018. Laboratory studies on the oviposition stimuli of Culicoides stellifer (Diptera: Ceratopogonidae), a suspected vector of Orbiviruses in the United States. Parasites & Vectors 11(1): 300. Frank JH. 2018. A worldwide checklist of parasites of Staphylinidae (Coleoptera). Chapter 10, p. 183-225. In Betz O, Irmler U, Klimaszewski J. Biology of Rove Beetles (Staphylinidae). Springer-Verlag, Heidelberg. Halbritter DA, Willett DS, Gordon JM, Stelinski LL, Daniels JC. 2018. Behavioral evidence for host transitions in plant, plant parasite, and insect interactions. Environmental Entomology 47: 646-653. Keller O, Branham MA. 2018. Notes on the Amydetinae (Coleoptera: Lampyridae) in McDermott’s 1966 catalogue of Lampyridae. Insecta Mundi 0628: 1-6. Russell JA, Campos B, Stone J, Blosser EM, Burkett-Cadena N, Jacobs JL. 2018. Unbiased strain-typing of Arbovirus directly from mosquitoes using nanopore sequencing: A field-forward biosurveillance protocol. Scientific Reports 3;8(1): 5417. Sourakov A. 2018. The Emperor’s new clothes: Radical transformation of the wing pattern in Asterocampa clyton caused by heparin. Tropical Lepidoptera Research 28: 29-31. Vickers ME, Taylor LA. 2018. Odor alters color preference in a foraging jumping spider. Behavioral Ecology DOI:10.1093/beheco/ary068. Striped cucumber beetle, Acalymma vittatum F. Authors: Braden Evans and Justin Renkema. False chinch bug, Nysius raphanus Howard. Authors: Babu Panthi, Braden Evans, and Justin Renkema. Silverfish, Lepisma saccharina L. Authors: Eleanor F. Phillips and Jennifer L. Gillett-Kaufman. Do you have a favorite creature? Learn how to make it into a Featured Creatures! Dr. Thomas Chouvenc and MS student Johnalyn Gordon participated to the National Conference on Urban Entomology in Cary, NC, on May 20-23. Dr. Billy Crow taught nematology to the Charlotte County Master Gardeners on May 15th. Dr. Carey Minteer gave an invited presentation titled “Biological Control: Using nature to fight against invasives” at the 2018 Aquatic Weed Control Short Course held in Coral Springs, May 7-9. Dr. Eutychus Kariuki, a post-doc in the Minteer lab, gave an invited presentation titled “Impact of Cricotopus lebetis on the competitive ability of Hydrilla verticillata” at the 2018 Aquatic Weed Control Short Course held in Coral Springs, May 7-9. Dr. James P. Cuda was a co-author on the presentation. Dr. James P. Cuda participated in the UF/IFAS Invasive Species Council Meeting held at the Alachua County Extension Office on May 15th. The purpose of the meeting was to develop a vision for the Council and draft a mission statement. Dr. Adam Dale gave a presentation about recent challenges and progress in insect pest management on turf and ornamentals at the UF/IFAS Florida-Friendly Landscaping and Master Gardener In-Service Training on May 23rd in Fifield Hall on main campus in Gainesville. Dr. Adam Dale gave a presentation on the identification and management of insect pests of ornamental plants for the Entomology Extension Academy In-Service Training hosted by Dr. Xavier Martini at the UF/IFAS NFREC in Quincy, FL. Dr. Adam Dale gave a presentation about the benefits of creating wildflower habitats in out-of-play areas of golf courses to the Florida Golf Course Superintendent's Association Seven Rivers Chapter at Golden Ocala Golf and Equestrian Club on May 16. Dr. Adam Dale and Erin Harlow (UF/IFAS Extension Duval Co.) gave a presentation on developing pesticide resistance management programs in urban landscapes at the Southeast Pest Management Conference on May 9 in Gainesville. Dr. Christine Miller presented “Sexual Selection and Trait Investment in a Dynamic World” to the Department of Zoology, University of Cambridge, UK as part of their Behaviour, Ecology & Evolution Seminar Series. ABOVE: Laurel Lietzenmayer and George Roman at the Santa Fe Teaching Zoo for Tree Kangaroo Awareness Day. The live critters are always a hit with children and adults alike. The critters are available for you to check out should you be leading an outreach event. We have doubles of our most popular critters, as well as various native insect species depending on the time of year. We have large wood and Plexiglas cages for viewing our native orb weaving spiders. There is one travel cage and one larger static cage. Please be sure to contact us and review the protocol on transporting and handling the critters if you are not already familiar with it. If you lead an outreach, be sure to fill out a documentation form so your event can be included in the newsletter and we can log all outreach events. Thank you — Laurel Lietzenmayer, Outreach Coordinator. If you would like to schedule an event or have any outreach questions, go to the Outreach pages on our Bug Club website and contact us. Dr. Phil Kaufman and Dr. Chris Geden, USDA-ARS-CMAVE, received a $16,000 grant from Southeast Milk Check-off program for a project titled: Improved Fly Control using Biological Control Agents. 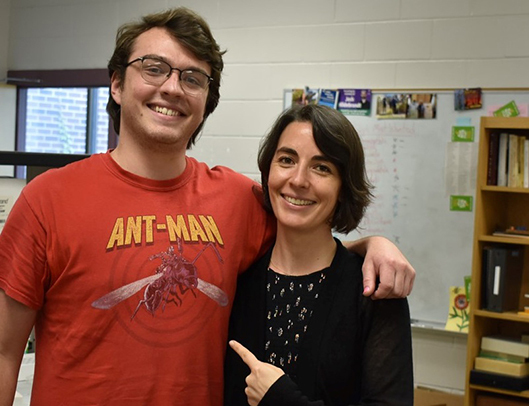 The student must be a member of the Florida Entomological Society and a full-time student with at least one year remaining in his or her degree program. Applications from undergraduate students will be considered. The application should include a transcript, letters of recommendation from two faculty members, curriculum vitae, and a statement from the student about his or her future plans in the field of entomology. Minigrants: The Florida Entomological Society will award four mini-grants of $250 each to student members for entomological research. Applications should consist of a one-page description of the research and a list of the items to be purchased. 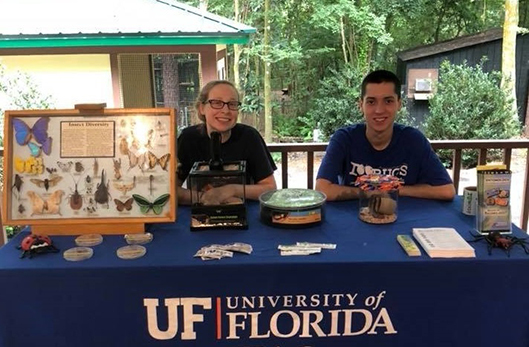 Travel grants: The Florida Entomological Society allocates funds to assist students with the cost of attending the society’s annual meeting. Students requesting travel funds should send a letter stating their purpose for attending the meeting and their other potential sources of travels funds. Annual Achievement Award for Research. Annual Achievement Award for Extension. Annual Achievement Award for Industry. Annual Achievement Award for Teaching. Annual Achievement Award for Regulatory Entomology. Achievement Award for a Collaborative Research Team. Winners will be announced at the 2018 Annual Meeting. Each nomination should be accompanied with a justification narrative that will be read at the awards luncheon. Nomination deadline is June 20, 2018. We have several social media sites for the Entomology & Nematology Department. To make them easily searchable, all three (YouTube, Facebook and Twitter) have the same page name: UFEntomology. Please share these links with past students or colleagues who may have an interest in departmental activities. Want to stay up to date? Check out our website home page for a link to our Google calendar. Dr. Jennifer Gillett-Kaufman is the newsletter editor and does the HTML coding. Issues usually are published by mid-month. Submit items for an issue by the seventh of that month. We like to share news when it happens using our social media outlets: Twitter, Facebook and YouTube. Follow us on these sites for daily updates! When you send news, we will post it on one or more of these sites and again in the monthly newsletter. Please be sure you have permission from people in photographs you submit for publication. UF-Bugnews-L listserv subscribers receive notices when issues are posted. Our home page has instructions for subscribing and unsubscribing. Special thanks to Haleigh Ray and Nancy Sanders, who reviewed the newsletter for errors, and to Jane Medley and Don Wasik, who built the web page design. 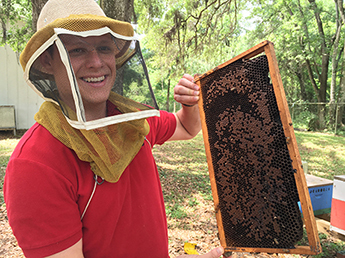 Want to support the UF Entomology & Nematology Department? Consider making an online gift today! Questions can be directed to Christy Chiarelli at (352) 392-1975 or ccw@ufl.edu. © UF/IFAS Entomology and Nematology Department. All rights reserved.